As I sit here, I type this in disbelief. Saeed Ajmal has been banned. Have you managed to wrap your head around it? Does it hurt? If you’re a cricket lover you can feel the loss. If you’re a Pakistan cricket fan, your world has just been ripped apart and any semblance of world cup victory dreams have now been shattered in front of your very eyes. Where is the justice in this world? How did the International Cricket Council (ICC) clear him in the past only to go back on their previous statements? Are we resigned to the fate that every time Pakistan cricket finds a little magic, it is taken away? Saeed Ajmal was unplayable because his deliveries were genius. We’ve heard the commentators, the statisticians and the players of teams the world over praise him, mesmerised by his spell and skill, a skill now deemed illegal by the International Cricket Council. How will Pakistan ever recover? I cannot quite gather what the ICC’s intentions were. Saeed Ajmal made his international debut in 2008. It has been six years – six baffling years where the enigma that is Ajmal managed to skyrocket to the number one ODI bowling ranking. No easy feat, considering the ICC has managed to completely tip the scales in favour of batsmen. Cricket has become impossible for the bowler. Boundaries have been brought in, power plays, fielding restrictions and pancake pitches have been every bowler’s nightmare. Yet they persevere, they find turn, they pray for dew, they find a spark, some form of magic. In Perth 2009, the tests revealed Ajmal on an average straightens his arm about eight degrees, well within the ICC tolerance limit. Five years later, in Brisbane in 2014, the ICC claimed that all his deliveries exceed the tolerance limit of 15 degrees. Bowlers are now being tested under new protocols but such a huge contrast between two results is unnerving. Were the testing procedures used earlier inherently flawed or far too lenient? What changed? What revelation caused the ICC to make such a drastic call and is it fair? When Ajmal was cleared in 2009, it was under the protocols, which also cleared Muttiah Muralitharan, Shoaib Akhtar, Brett Lee and Harbhajan Singh, amongst others. It appears that these bowlers would have been in serious trouble if they were tested under the new protocols, which in the last few months have suspended Sachithra Senanayake, Kane Williamson and Saeed Ajmal. Is anyone safe? Being a bowler is hard enough; being a spinner in today’s cricket climate and you might as well send in your resignation. Pakistan seems to be jinxed with their bowlers and their world cup campaigns. In 2007, the bowling duo of, Shoaib Akhtar and Mohammad Asif, were banned for testing positive for drugs. 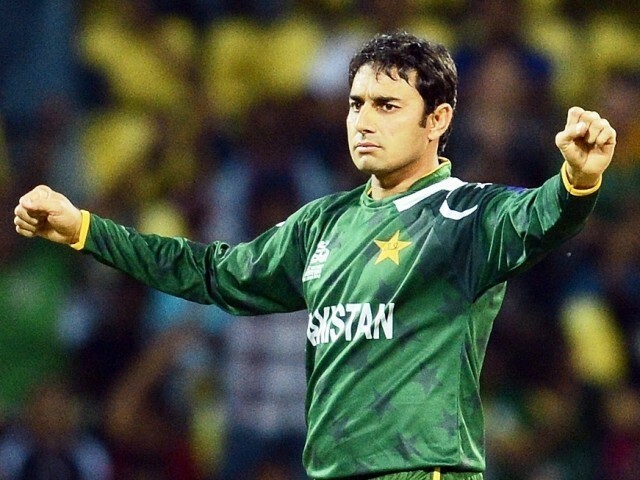 In 2011, the still painful spot fixing scandal saw Mohammad Amir take his leave and now Pakistan risks losing their “secret weapon” Ajmal for the 2015 World Cup. While it seems that he can reapply at any time, the ICC’s decision has left many Pakistani fans more sceptical of the system in place. Moreover, will the Pakistan Cricket Board cause ruckus or will they simply take this lying down? The PCB celebrated their status as the “fourth” nation after the big three but will their word hold any real weightage? So many unanswered questions, so much doubt, a barrage of emotions. For many fans of the sport, cricket is their first love, the kind you’ll never forget. Today my heart breaks for the game, for the player whose magic lit up stadiums, for a country and for a team that was looking to relive the glory of 1992 on Australian soil. To adorn that green jersey, to play the game and to dream has now become a thing of the past. Saeed Ajmal must be applauded for all that he has given to the fans of this game, our saviour, the comedian, there is no doubt he will be missed. Ajmal should have bowled with a different action during testing (like he did -as per Stuart Broad – during his Perth testing). This time, ma y be, he thought he can get away with it, probably not aware that the protocol and the parameters have changed. Is anyone safe ? Nope. Chuckers will get the batsmen and commentators talking. And the Umpires. Why can’t Pakistanis be more honest in their day to day living. Why always cheat and then lose and then cry. Regarding the contrasting results in 2009 and 2014,a true cricket follower do know that a bowler constantly changes the action so that the batsman doesnt start recognizing his guile.. What??? A whole new blog on Ajmal’s ban and no mention of BCCI, ICC and conspiracy against one strong Islamic nation. The ban on Murali should never have been revoked as his bowling action was indeed like a javelin thrower, I did not see much wrong in the way Ajmal bowls and yes, he is one of the best spinners in the contemporary times. Can you show me any picture or video of Saeed Ajmal bowling the Doosra without a full armed sleeve? If they continue getting our danger-men in cricket out, it proves their fears of them. Therefore, logically, they have accepted defeat. Otherwise, 15 degree or any degree bend is not of their own making. They have acquired the skill through sheer training and practice.